A. What do you need to accomplish? A first step in designing meetings for success is to take stake stock of what you want a meeting to accomplish. What do you need the meeting to produce? Be clear about the meeting's product, lest time be consumed without result. Who needs to be involved? What stakeholders will be affected? Who needs to be present? What viewpoints / authority need to be present? When the right people are not in the room, decisions may be ill informed or left unmade. 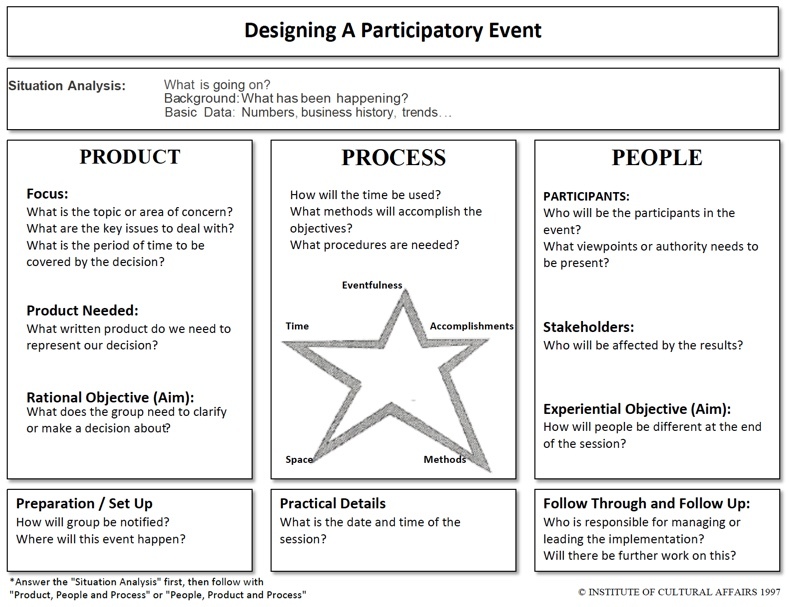 With those two areas clear, the facilitator can establish the rational and experiential aims of the meeting and be purposeful in invitations. B. How do you plan to accomplish it? 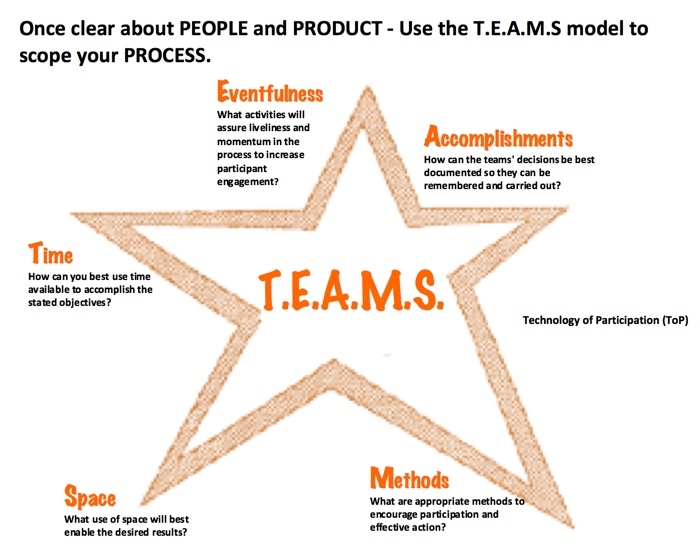 When the People and Product are clear,,, T.E.A.M.S. for Effective Meetings provides tips about Process. C. How will you define success? A hallmark of ToP events is participation. 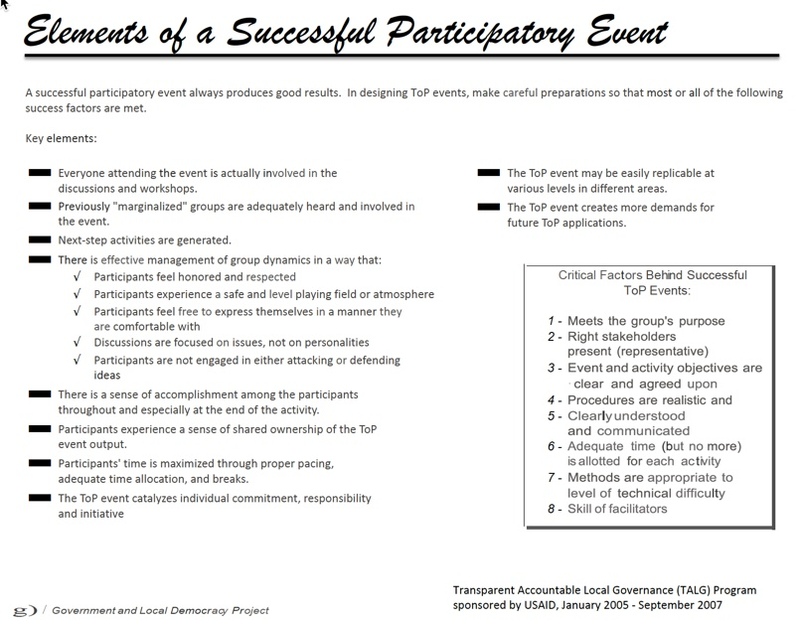 A successful participatory event requires careful preparation with close attention to assure success factors are present. D. Where can you get help with your questions? 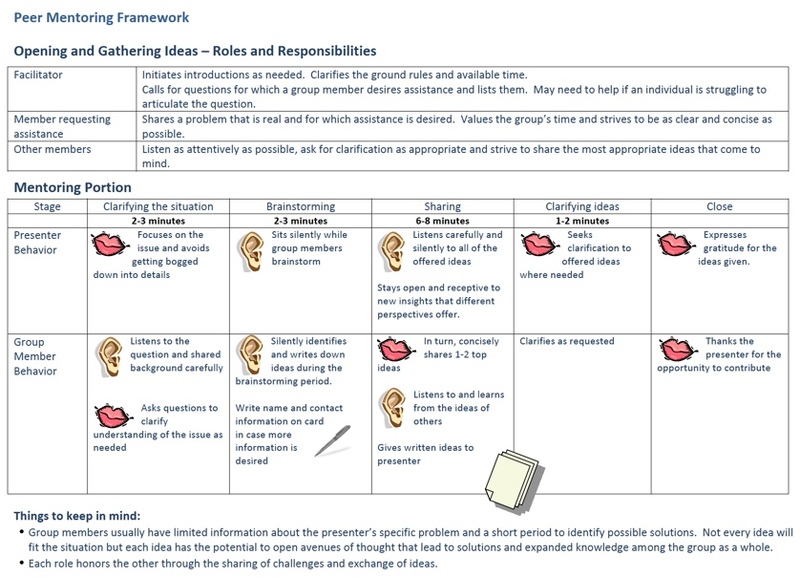 The Peer Mentoring model generates lots of ideas in a short time to deal with a question. Highly structured, it allows a presenter to quickly share a question on which help is desired, followed by brainstorming approaches for consideration. The secret is in listening and brainstorming in silence. Creative ideas bubble up quickly. This resource provides instructions and the companion document, Peer Mentoring is...is not provides more detail about the appropriate use of this approach.